California is facing another drought, and so are many other states. Water use may be curtailed causing water rates to go straight up. Summer is when our water bill goes ballistic with >$100 months commonplace. Gardens use a lot of water. Lawns can easily use 50-80% of a household’s water. Our garden uses close to 75% of our water, probably because we conserve so much. Drought Tolerant Plants, drought resistant plants, and Xeriscaping, help you by saving water in garden. Plan and Design your garden on paper. How will it be used? Hardscaping or using soil, gravel, or rock pathways use no water. Space plants further apart to give roots more space. Compost and mulch to help the soil retain water, prevents erosion, and keep weeds away. Some people use old newspaper as mulch. Add a generous two to three inch layer of mulch around the base of plants. Water your garden efficiently. Intelligent sprinklers, zones, water deeply and infrequently, water in morning. Collect rain water. 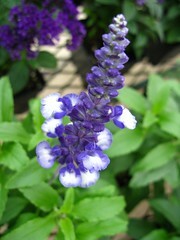 Select Drought Tolerant plants and Native plants. Group plants with similar light and water requirements. Put moderate water-use plants in low-lying drainage areas, near downspouts. Plant Vegetables in shaded areas. Maintain your garden. Fertilize, cut grass and recycle grass, prune, compost remains. Some fertilizer companies recommend five fertilizations a year, yet many lawns can survive with only two. Use water without waste with these tricks: recirculating fountains, bird bath, dry creek bed, or water jars and urns. Some cities and water departments like Austin, Texas and Cary, North Carolina pay “cash for grass” . Keeping a green lawn takes a lot of care and cost. During hot weather, lawns need 1/2″ of water ever other day. Best time to Water your lawn, grass, or garden is early in morning to lessen evaporation. Water not at night as lawn disease may occur. Water more deeply, not more often. Water every other day. Most grass can survive a month without water. Some people allow their lawn to go brown during drought spells. Make sure your sprinkler system is setup correctly, water times are set optimally, and water does not leak. Utilize drip irrigation, flag drippers, spot watering, smart controller, high tech sprinklers, rain shut off and micro spray watering heads for particular areas. Lawns use 50-80% of a household’s water. That amounts to a lot of money every year! Here are some tips to save on water. Keeping a green lawn takes a lot of care. After the kids have outgrown play areas, consider dumping your lawn. Ditch the lawn or replace it with artificial turf. Flowers use less water than grass. Pathways use no water. Mulch in gardens prevents soil erosion, helps keep moisture in the soil, and keeps weeds away. Be cheap and let your lawn die, then paint the dead grass green. There is special lawn paint made for this. This paint can last from 2 weeks to 6 months. Look for natural products that do not contain toxic latex paint. Grasscycling is a leaving your glass clippings on your lawn, allowing them to decompose and fertilize your lawn. I learned about it from a RecycleWorks brochure. Save time with less raking, bagging, etc. You basically do not cut any more than 1/3 of the length of the grass blade at one time. The grass should be dry when you mow. Mower blades should be sharp. In the fast–growing season you may have to cut every 7 days-but in the slower growing season you might only need to cut your lawn every 1-2 weeks. Adjust your mower to raise cutting height and remove collection bag. The rule that said you should never cut more than one third of a grass’ blades height was from the USDA in the 1950’s. These days most grasses can survive 50% or more removed. There are special recycling mowers available on the market with side chutes that leave this mulch on your lawn. More mulch = less fertilizer needed = money saved. 99% of the time, you are better mulching. Only after a long rain or vacation, should you bag grass remains. Most lawns in California need 1 inch of water every 5 to 7 days during the growing season. Water your lawn a lot less earning slow-growing ones. Water in the early morning to lessen evaporation loss and prevent disease development. Deep infrequent grass watering helps produce cheaper, more extensive root systems. The most green Eco Friendly mower is the classic push mower. No gas, no fumes to worry about. Push the mower and burn 540 calories an hour using it! There are many weeds and pests that do not harm your lawn. These grasses are slower growing and more drought resistant. You may save 50% on your grass care with a Fine Fescue. Weeds are a fact of life in gardens. Using harsh chemicals to eliminate weeds simply causes other problems. 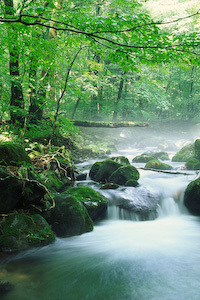 Eco-friendly green Weed Prevention is available through the use of several products. Weed block landscape fabric is used on permanent landscape and garden areas, under patios, sidewalks, and decks. It is made from INGEO fiber and is derived from renewable resources. You can also buy a recycled version. You can also use cardboard and newspaper underneath wood chips or mulch. 1) Water your garden less often, but using more water. 2) Use an irrigation controller that sense weather conditions. Water early in the morning or late at night. 4) Group plants and shurbs by water need. 5) Mulch your garden. Mulch prevents soil erosion, helps keep moisture in the soil, and keeps weeds away. 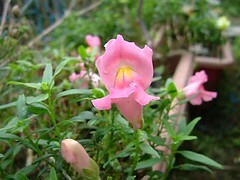 Flowers use less water than grass. Here are some suggestion for the San Francisco Bay Area, consult your local nursery for additional ones. Many Mediterranean, South African, and Australian plants can thrive here with low water footprints. Try to group plants of similar watering requirements. Bearberry (Arctostaphylos UVA-ursi), Baja fairy duster, Firecracker penstemon (Penstemon eatonii),Wild lilac (Ceanothus), Nepeta, Lambs ears, meadow grasses, fesuca occidentalis are all good low water tolerant plants too. San Francisco Bay Area Bay Area Water Supply and Conservation Agency or BAWSCA has free landscape education classes and also a Lawn Be Gone Rebate program of $500-$3000. This book includes practical advice on how to replace thirsty, water-guzzling lawns with more sustainable, drought-resistant and interesting landscapes. As the author mentions, lawns go away as water rates go up. 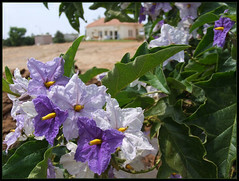 More people are moving towards Mediterranean plants and California natives. Other lawns alternatives include kitchen gardens, rock gardens, meadows or carpet/tapestry garden. WSJ has a review of more eco friendly green garden tools that use battery power or propane. It is good too see more alternatives to gas guzzling garden gear. Most of the products performed better than expected indicating few compromises. Home Depot even sells corded and battery-powered push mowers, Lehr trimmer fueled by a propane canister, and the Ariens battery AMP Rider online. Sunset Magazine has a plant finder. This article has tips on less thirsty landscapes including using permeable surfaces, Permeable paver stones, stepping stones, pea gravel, decomposed granite, mulch, irrigation. The article’s resources are useful. How Green is your Garden? We are not asking how lush your garden is! We want to know how eco-friendly your garden is. Here are some resources to help build a green, sustainable garden. Sunset Magazine has a hungry use your garden quiz. Key elements in gardening include avoiding pesticides, composting, planting native plants and trees, minimizing Drought Tolerant Plants, Xeriscaping, Saving Water in Garden, and recycling. 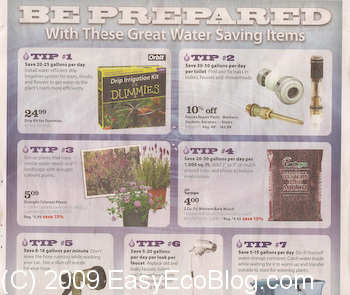 OSH had a nice newspaper ad outlining 7 tips for saving water. They cover items from outdoor plant watering to toilets to collecting shower water. Hope this gets more people to spend some money to save a lot more in wasted water costs, while helping them go green. Spring is when we start thinking about purchasing new lawn equipment and motorboats. US Environmental Protection Agency issued new emission standards for small engines used in lawn equipment and small boats aimed at significantly reducing pollution in our air and waterways. 2010 is when the new boat standards kick in. 2011 is when the new lawn and garden equipment rules start. Be sure to keep this in mind when upgrading or buying new gear. You’ll reduce the toxic gases you inhale and help clear the air. A single ‘old-style’ lawnmower emits as much pollution in an hour as 50 cars driving 20 miles. Many of the newly compliant lawnmowers will include catalytic converters. Since January 1, 2007, California has required fuel powered mowers with catalytic converters, so this is not new here. If you are concerned by this, you could buy a unit that is California compliant and not wait for 2011. Also consider buying an electric mower. Many areas have electric lawn mower rebate programs. Many counties will work with your local hardware store and offer incentives to replace your old ungreen gas lawn mower. Worx has a rebate when you buy their new electric mowers.